On the first day of Laurel’s senior year there are two new arrivals. Tamani — the electrifying faerie with whom she shares an undeniable connection — appears, posing as a foreign exchange student. And even more disturbing is another foreign exchange student named Yuki whom Laurel quickly realises is a faerie, though the new girl doesn’t seem to have any idea who or what she really is. Laurel is determined to figure out how Yuki fits into the picture, and what connection she may have to the ever-increasing threats to her family and Avalon. Meanwhile, Laurel struggles to maintain a balance between her human boyfriend David and Tamani, with whom she shares a passionate past. But balancing two worlds is becoming more and more complicated. When the threat to Avalon grows ever stronger, Laurel’s illusion of control of the situation shatters and she must confront a danger even greater than the trolls. I have been anxiously awaiting this next installment for the last year. I really love this series, and couldn't wait to get my hands on it! I've been having a hard time actually relaxing enough to read a book since having baby Sebastian, and I just knew that WILD would get me back on track for reading. These books are brain candy for me! I was back to my old self, and I read it in one day! The story doesn't start where the last book, Spells, left off. Some time has passed. Not much, but enough that I'm dying to know what was going on in those few months. I'm a non-spoilery kind of reviewer, so I don't want to give anything away! I'll just say this, I LOVED IT! I love the take on faeries, and how different they are. I love everything about Avalon, and I wished we would have spent more time there in this book. I'm a huge Tamani fan. David who? I love how strong and unchanging he is. He is always there. He is so selfless. Even when I think he should show Laurel what's what sometimes. He doesn't, because he loves her. Tamani is the stuff dreams are made of, and I've had quite a few dreams with him in it. Laurel did make me mad a few times in this book. Girl needs make up her mind! I love all the magic, danger, intrigue, and romance that this series gives, and WILD does not disappoint. 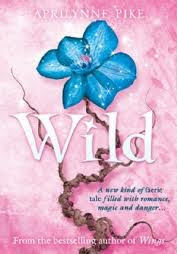 WILD is perfect for any young girl who loves faeries, or an adult who is looking for some romance. Oh, and there is a cliffhanger. I hate cliffhangers. Until next year for the ending to this series! She nodded, very slightly. "But-"
"Then you can," he said. I'm excited to read this!!! Thanks for the review!